Freedom and safety of operation on a two-lane highway, besides being influenced by the extent and frequency of passing sections, are adversely affected by heavily loaded vehicle traffic operating on grades of sufficient length to result in speeds that can impede following vehicles. In the past, the provision of a climbing lane to improve operations on upgrades has been limited because of additional construction costs. However, because of increasing delays and the number of serious crashes occurring on upgrades, such lanes are now more commonly included in original construction plans and additional lanes on existing highways are being considered as safety improvement projects. 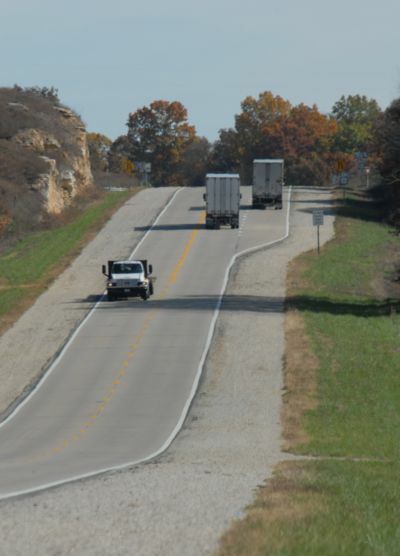 Climbing lanes are generally applied as a spot improvement, most often on steep sustained grades that cause heavy vehicles, particularly heavy trucks, to travel at slow speeds. This reduces capacity, creates platoons, and increases delay. Additionally, safety problems may arise when the reduction in speed of heavy trucks exceeds 10 mph along the grade (a heavy truck is one with a 300 lb/hp ratio). The volume and percentage of heavy trucks are factors in justifying the added cost of the climbing lane. A typical design for two-lane highways with climbing lanes is available. Climbing lanes are designed for each direction independently of each other. Depending on the alignment and profile conditions, they may or may not overlap, when there is a crest with a long grade on each side. It is desirable to provide a climbing lane, as an added lane for the upgrade direction of a two-lane highway where the grade, traffic volume, and heavy vehicle volume (this includes recreational vehicles) combine to degrade traffic operations from those on the approach to the grade. Where climbing lanes are provided there has been a high degree of compliance in their use by truck and RV drivers. Upgrade traffic flow rate exceeds 200 vehicles per hour. Upgrade truck (and/or RV) flow rate exceeds 20 vehicles per hour. A 10mph (15km/h) or greater speed reduction is expected for a typical heavy truck. Level of Service (LOS) E or F exists on the grade. A reduction of two or more levels of service is experienced when moving from the approach segment to the grade. In addition, safety considerations may justify the addition of a climbing lane regardless of grade or traffic volume. The Highway Capacity Manual and the AASHTO Green Book can also be use to determine the need for climbing lanes. The upgrade flow rate is determined by multiplying the predicated or existing design hour volume by the directional distribution factor (the percentage of the design hourly volume moving in one direction) for the upgrade direction and dividing the result by the peak hour factor (the percentage of the AADT during the 30th highest hour determined for the year). The number of upgrade trucks (and/or RV’s) is obtained by multiplying the upgrade flow rate by the percentage of trucks in the upgrade direction. Standard shoulders are used throughout the length of the climbing lane unless a lesser shoulder width would substantially reduce costs. In no case will the shoulder width be less than 4 ft. Pavement marking, and signing are essential to the operation of climbing lanes. Climbing lanes should be extended over crests whenever possible to facilitate truck acceleration. This page was last modified on 24 November 2010, at 12:14.